As smartphone adoption skyrockets, so do the studies documenting its impact on shopper behavior. This category consists of improving the in-store shopping experience. 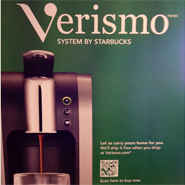 A good example is Starbucks, which placed QR Codes throughout its stores to promote the new Verismo coffee maker. Consumers who scan the code can learn about the product, see what others have to say and even buy it then and there (with free shipping as an added incentive). They can also search for other Starbucks items to purchase, sign up for the company’s newsletter, connect with the brand via social media and receive a 10% coupon off of their next order. Another example is Sainsbury’s Scan & Go proposition. Users can shop with their smartphones and pay at the the counter without unloading their bags. Though still in trial mode, a few select shoppers can download the app and register using their loyalty card. While in store, they need to scan the ‘Check In’ QR Code at the location and then use the phone’s camera to scan barcodes on products as they shop. As items are added, a running total shows how much the customer is spending and any possible savings along the way. Customers then scan the ‘Check Out’ QR Code at the counter and pay as usual with cash or card. The idea is to use mobile technologies to extend the retail environment beyond shopping hours or the physical boundaries of your brick-and-mortar retail stores, and to do so without the incurring costs that typically go along with it. 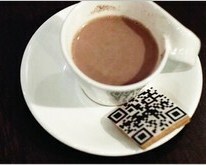 The ‘Eat What You Read’ campaign by the Advertising Agency Grey Group in Hong Kong illustrates this concept: edible QR Code cookies were given away for free to consumers in popular cafes. When scanned, they offered smartphone owners the opportunity to download a free trial e-book. According to the agency, 8,000 QR Code cookies were distributed in one week. The campaign, which cost approx. $5,000, resulted in increased visits to the client’s website by 45% and sales by 12%. An experiment led by Paypal also nicely demonstrates this idea: a QR Code is stuck to the store front window and passers-by can scan the items on display, select the desired color/size and buy it with PayPal in just one click. Virtual stores take it even further. Tesco in South Korea kicked off this model during the summer of 2011, and has since been enthusiastically adopted by many retailers, some of which we covered today and others here in former blogs. Although retailers have been secretive about the results of these campaigns, the increase of virtual stores show no signs of slowing down. Early October, Carrefour, a French retailer, launched two virtual shops in France. Last month Mattel and Walmart Canada launched a QR Code virtual toy store in downtown Toronto. However, perhaps the most impressive of all is Chinese retailer Yihaodian, which opened 1,000 virtual stores located in iconic areas of Shanghai, Bejing, Guangzhou and Shenzhen. They also strategically placed the stores directly in front of Yihaodian’s offline competitor brick-and-mortar supermarket stores.